Businesses Give Back: What happens when an auto dealer wants to do more? What Happens When An Auto Dealer Wants To Do More? We are fortunate to be headquartered in a very giving area of Los Angeles. The South Bay is extremely generous with their time and money and we have many nonprofits that would agree that all you have to do is just ask. But when a company is actively seeking you out because they love your mission and want to give back, you take notice. McKenna South Bay BMW is just such a company. 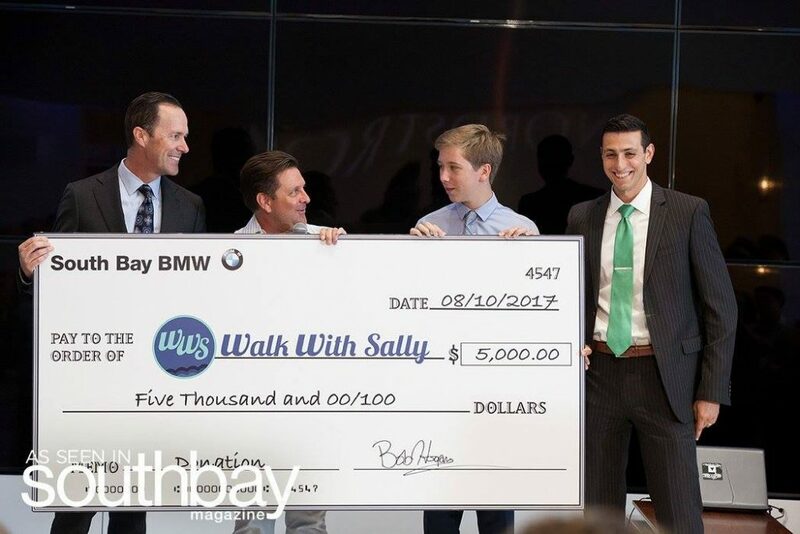 In June, South Bay BMW contacted our offices wanting to find out how they could help make the most impact and not only jumped into our largest fundraiser, White Light White Night as top sponsors, but also chose to sponsor a Walk With Sally Friendship through it’s first critical year! Because of their generosity we were able to match Brian and Liam. Brian lost his father to brain cancer when he was just 13 years old. Liam’s mom and dad are currently battling cancer and his dad lives far enough away that they do not see each other often. We were able to introduce this Friendship at the Shop for Sally event at the dealership last month. Check out the photos of the event and the video about Brian and Liam. Brian has been so moved by what we are up to and his match with Liam that he decided he also needed to bring his company into the Walk With Sally Family. Brian and his team at Charles Schwab & Co became Candlelight Sponsors at this year’s White Light White Night in July. We hope they are back every year! Thank you South Bay BMW and Charles Schwab & Co! If you would like your business to get more involved with Walk With Sally, just reach out to Michele McRae at mmcrae@walkwithsally.org or 310-322-3900. This entry was posted in Appreciation, WLWN 2017 and tagged Business, Schwab, South Bay BMW.